For those of you who don’t know, I don’t do well in the heat. Once that heat infiltrates my body, my brain turns into a mushy puddle. So, when it comes to cooking in the heat, I like to follow a couple of simple rules. First, find dishes that are best served cold. Need an example for what that might be? Okay, how about roasted corn and avocado salsa, just add the avocado right before you serve it. Next, you could break out some of the watermelon salad, just keep the watermelon, cucumber, and bell pepper in the fridge until you are ready to put the dish together. The best part about this dish is that these ingredients contain a lot of water, so not only do these items provide much needed hydration, but the high-water content allows them to stay really, really cold. Second, the barbecue can save your bacon, er..I mean chicken…I mean, well you get the idea. Seriously, the barbecue is a great way to apply heat without sharing it with the rest of your house. Plus, grilling is fun and an adult beverage is generally included in any outdoor cooking activity. So, any proteins or vegetables that can be cooked on the the ole’ cue, the better. Lastly, if you have to do any cooking inside, try to pick short-cooking applications to minimize the heat, or cook at the last minute if you can. Alright, shall we look at a dish that fits this criteria? Let’s go! Dishes that are best served cold…hmm, well I have some cut up watermelon, bell peppers, and a little feta. 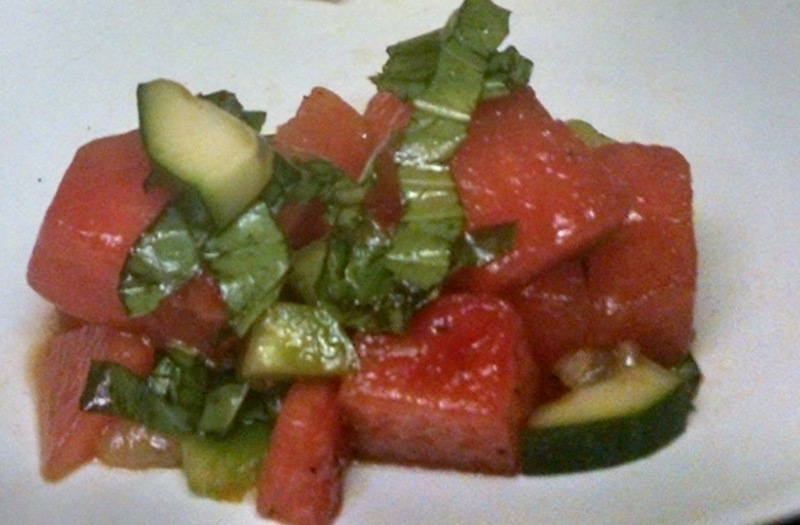 No, this isn’t deja vu, but since it was so hot outside we decided to enjoy the watermelon salad again. That’s right, it is that good! Need a refresher on this dish? Here is the link to complete this salad http://patrickstable.blogspot.com/2015/06/shakin-up-your-summer-salad.html. When it comes to the barbecue, do what ever works for you. You could do steak, chicken, pork, fish, or you could even grill some portobello mushrooms if that is more your style. 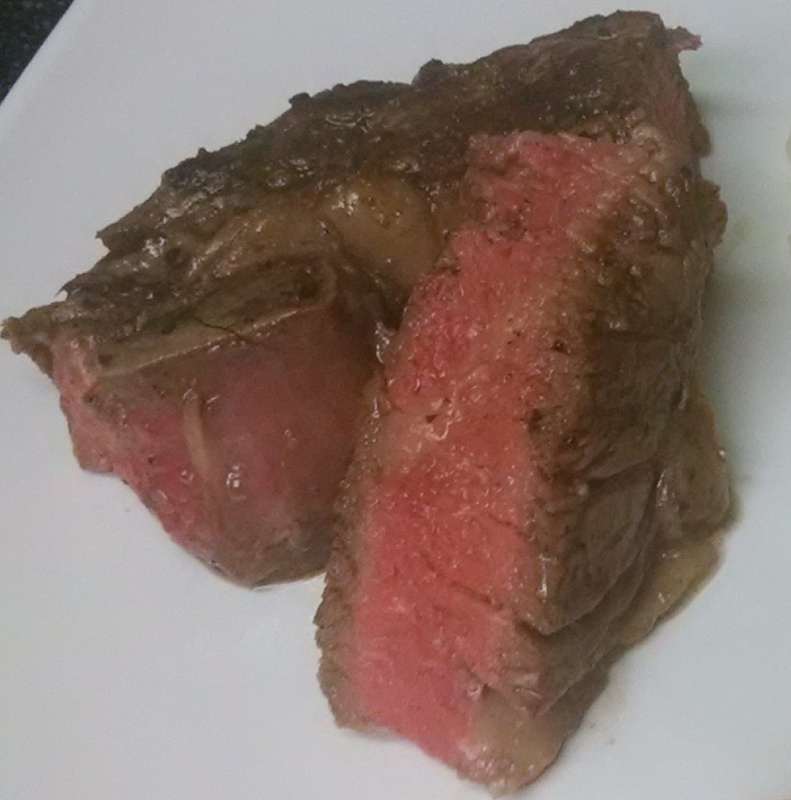 For me, a little rib eye steak fits the bill nicely. 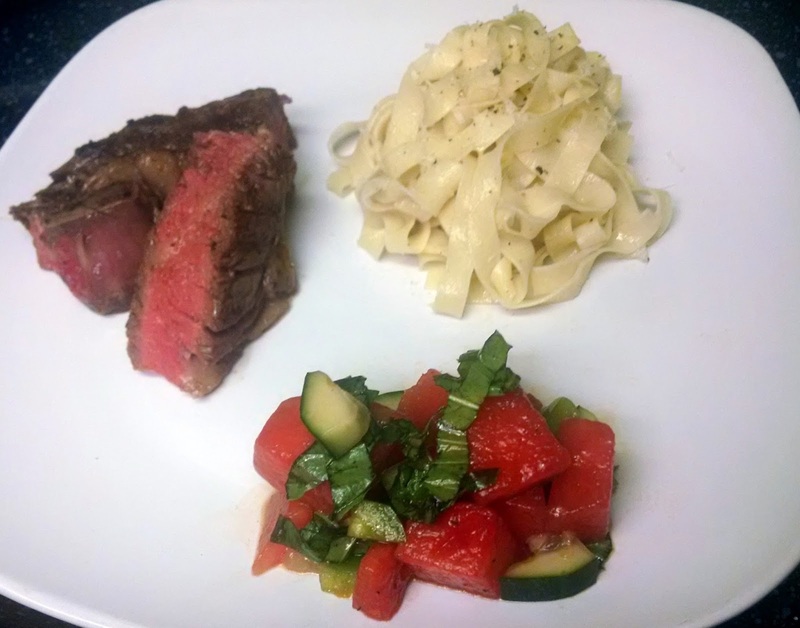 If you need to review making the perfect steak, follow this link http://patrickstable.blogspot.com/2015/04/party-on-barbie.html. Finally, we need something that will cook quickly but won’t add a ton of heat to the house. Okay, here is what I went with to make this summer meal the perfect trio. Thats right, we are going with a little pasta. Oh, did I mention these noodles are made from scratch? Yes, this is simple fettuccine style pasta. I know, why would I suggest making pasta as a quick cooking option? 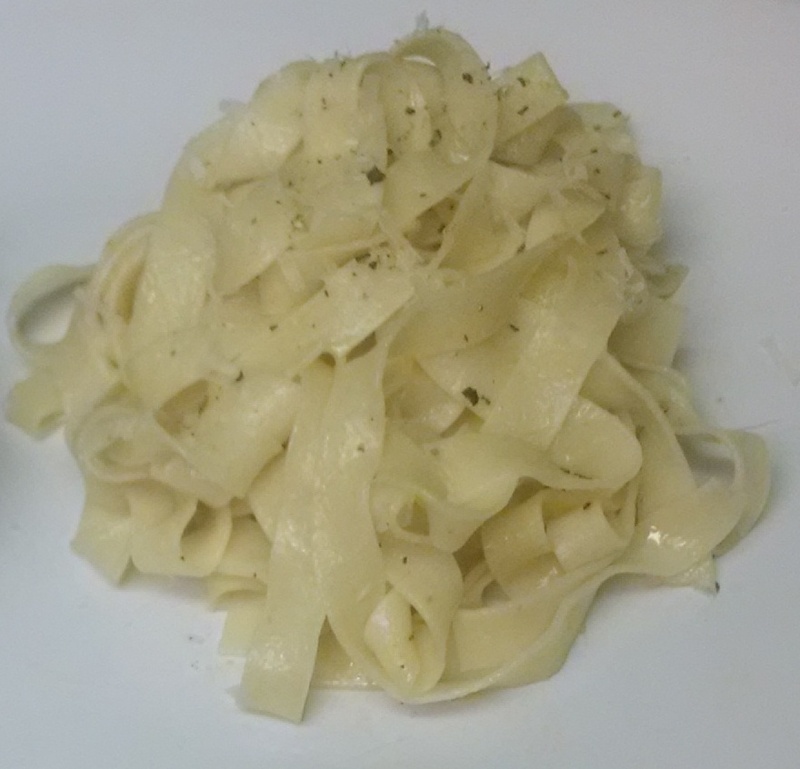 The truth is that homemade fettuccine rolled out on a pasta machine only takes 2-3 minutes to cook in boiling water. You read that correctly, it only takes 2-3 minutes and it is ready to serve. Now if you hand-rolled the pasta it might be a bit thicker and will probably take 5-6 minutes, but that is still less time than it would take to cook dried pasta. Make sure to taste the noodles to ensure if they are completely cooked to your liking. 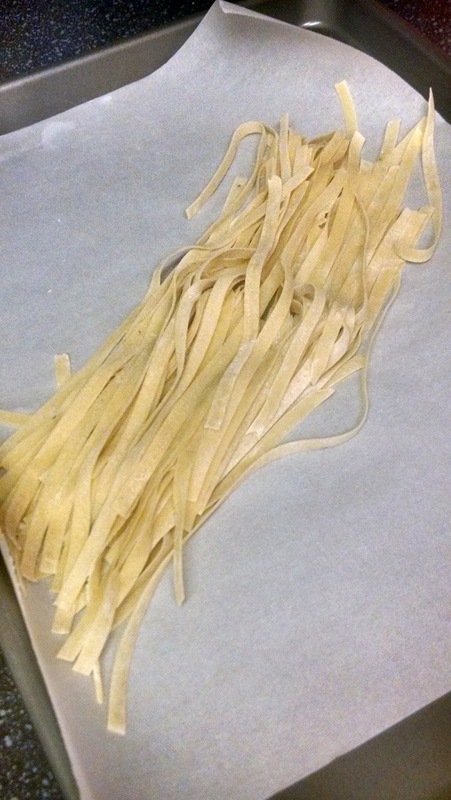 For the record, I am covering pasta making in various blog posts a little bit at a time. I promise, you too, can make pasta at home. After 2-3 (or 5-6 minutes), drain the pasta, add butter, olive oil, salt, pepper, and combine until noodles are coated. Right as you go to serve this grate a little fresh Parmesan cheese on top to give the noodles some extra richness. If you do that, you might end up with a something that looks like this. These are perfect, quick cooking, and are a delightfully blank canvas that you can flavor any way you like and cook yourself into the culinary-history books. How might this plate come together? Well, I will let this photo answer that question for you. This is a perfect way to beat the summer heat. The only thing missing is a nice glass of wine or a cold beer. So, before it gets any hotter, stop what you are doing and go beat that summer heat! You won’t be disappointed!